Arts & Culture For Fun! 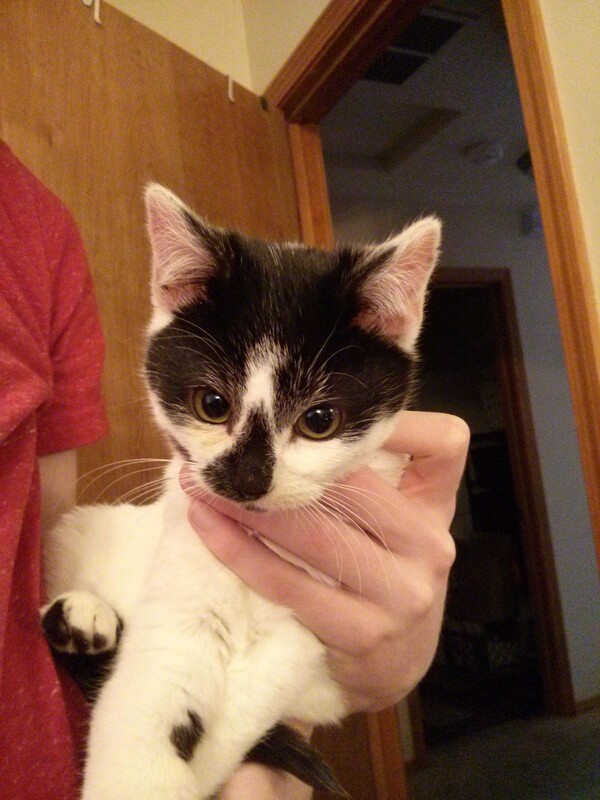 My brother's friend found the kitten on the side of a rural highway outside of the city a few weeks before Christmas. Knowing he's a cat guy, she called and asked what Andrew thought she should do with the kitten, who was injured — she guessed a broken leg. It was late, past 10. My brother offered to watch the kitten for the night, planning to take it to the shelter in the morning. In the beginning everyone thought the tiny cat, no more than three months old, was a girl. Turns out, she was really a he. He earned the name Panda from his foster parents. The first night Panda stayed with my brother, Andrew. The first and only night he stayed with my brother, Panda slept right next to him in bed, snuggling and purring incessantly, despite the unknown injury he'd sustained. Our guesses: hit by a car, intentionally thrown from a moving vehicle, caught in something, attacked by another animal. But there was no blood, just an old scab wound. His white fur was clean, his belly round and well-nourished. But his front right paw was bloated and swollen, almost twice as big as the other. The next morning, Andrew took Panda to the Spokane Humane Society, and the shelter manager agreed to take the kitten into their care. The shelter's veterinarian was off that day, a Friday, but over the phone he instructed warm compresses be applied to the leg until it could be examined on Monday. My coworker here at the Inlander, Raevyn West, agreed to foster Panda over the weekend since our family cat, Alice, would have nothing to do with this "intruder," nor my brother harboring it in his bedroom. On Saturday morning, Raevyn told me she and boyfriend Jordan were taking Panda to their veterinarian. 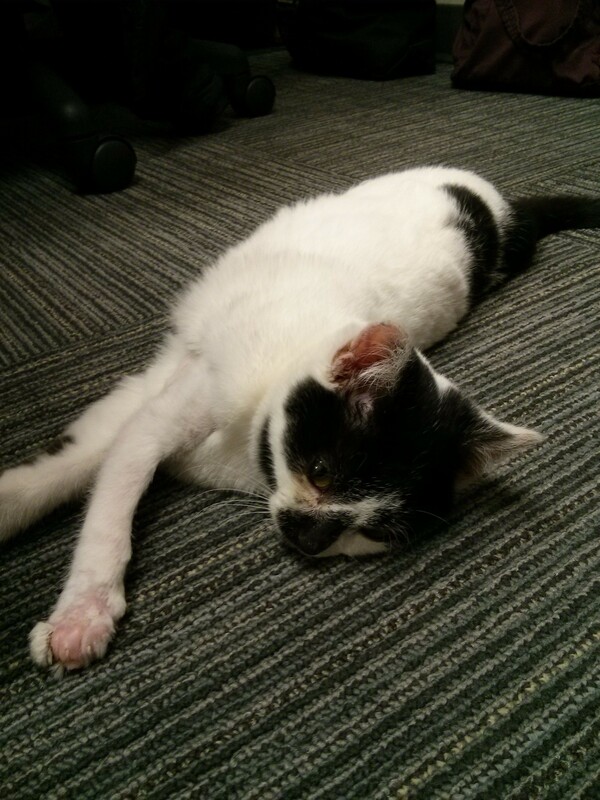 The swelling in Panda's paw and his overall condition had drastically worsened overnight. Their vet said Panda's leg was probably injured from something tightly tied around it, maybe even deliberately based on the even red lines under his fur. When the wound closed up at the surface, an infection spread rapidly. The doctor guessed if we'd waited all weekend, he'd have lost his leg. With the wound drained and antibiotics prescribed, Panda went back home with Raevyn and Jordan, who agreed to foster him until he'd healed and could go up for adoption. In less than 24 hours, they'd fallen head over heels for the tiny white and black-spotted kitten who cooed and trilled, and became their cat Thunder's temporary best friend. Panda stayed with Raevyn, Jordan and Thunder for more than five weeks while his leg slowly healed. After the swelling went down, the dead tissue around his foot lost its fur and scabbed off, new healthy tissue underneath. Even though they'd caught the infection before it was too late, at first no one knew if he'd keep the leg. It took weeks before he began even testing out walking on it again. Panda would come visit the Inlander staff after check-ups at the Spokane Humane Society. This photo from several weeks ago shows how his paw had begun to heal. Panda went to his forever home on Monday, Jan. 20. It was a hard choice for Raevyn and Jordan, to let go of this little kitten who'd played such a big role in their lives for more than a month. But they knew having another cat would make it more difficult to continue fostering kittens for the Humane Society. It never gets easier as a shelter pet foster parent, to let the litters of tiny kittens and puppies or hard-luck cases go when they've entered your lives and hearts so deeply. Panda is one of more than a dozen kittens the couple has taken into their home over the past year to nurture and socialize before becoming someone else's beloved pet. When I look back at Panda's experience, my heart is warmed thinking of all the people who stepped in to help him: my brother's friend, Anandae, who stopped to pick him up of the side of the road that night (she later went door-to-door to see if someone missed him); the shelter staff and the veterinarians who cared for him. But most of all, his doting foster parents and foster brother, Thunder, who nurtured him and chose to adopt him out so they could continue helping other lost, abandoned and injured kittens in the future. Thu., April 25, 7:30-9:30 p.m., Fri., April 26, 10 a.m.-12 p.m., Sat., April 27, 2-4 p.m. and Sun., April 28, 2-4 p.m.